Blessed by Unicorns is a state that that all Monster Rangers seek. But it’s not easy, as Unicorns are finicky ponies. This Spirit Badge was a featured reward for our 2017 Monster Scouts Membership Drive Kickstarter. 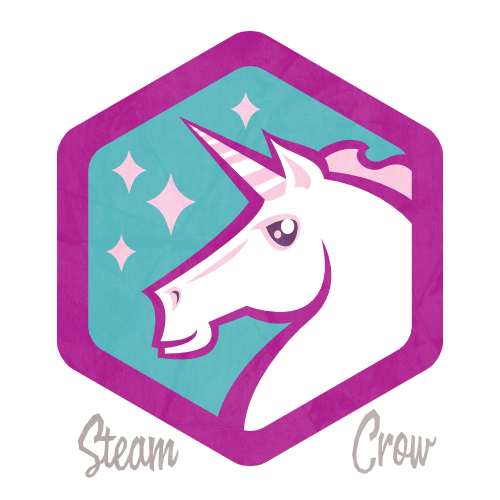 There is but 1 level of the Blessed by Unicorns Badge, but it probably has 7% more magic power than most of the other badges. Unicorns have 82% more magic than owlbears, 26% more magic than Wraiths, and 7% more magic than Leprechauns. The Blessed by Unicorns Badge is worth 10 Glory points. The Unicorn symbolizes infinite possibilities, wisdom, and success, but not pork rinds. This is a common badge. You can get yours, here! You don’t turn this in for credit; you simply log it into your personal Rangers Sketchbook –Ranger’s Honor!